Goldtone stainless steel case and bracelet. Fixed gold-tone bezel set with pink and clear baguette crystals. 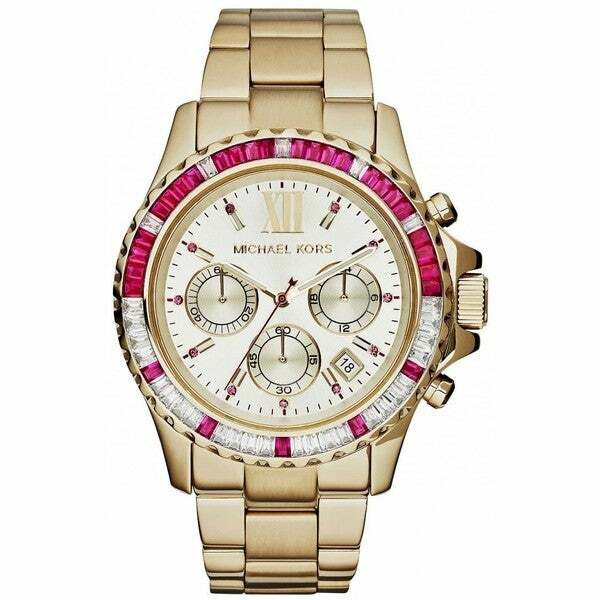 Light champagne dial with luminous gold-tone hands and index / pink crystal hour markers. Roman numeral marks the 12 o'clock position. Minute markers around the outer rim. Dial Type: Analog. Luminescent hands and markers. Date display between 4 and 5 o'clock positions.